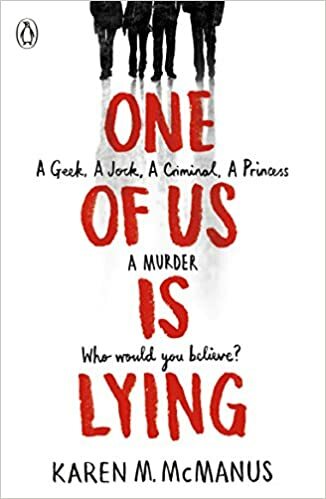 I recently read One of Us is Lying by Karen McManus. The premise of the book is interesting: The Breakfast Club meets the game Clue. I’d heard some positive buzz, so I thought I’d give it a go. It begins with five kids being stuck in detention: Cooper, the jock; Addy, the popular one; Bronwyn, the smartypants; Nate, the bad boy from the wrong side of the tracks; and Simon, the admin. of a gossip site that is invariable correct. Five kids go in, but only four come out. The rest of the book revolves around solving the murder of Simon, the gossip. The book alternates between the point of views of the four protagonists. I thought the author’s idea of introducing the “locked house mystery” to the YA genre was a good one and I was intrigued because I love unreliable narrators. Unfortunately, this book did not deliver at all. The lies that the title of the book refers to are all uninteresting and I saw the resolution (which I’m trying really hard not to spoil) coming from a mile away. The characters were incredibly cliche and the best thing about this book was the idea behind it. I’m probably being harsher toward this book than I’d normally be because there’s a situation in this book that I feel is seriously harmful toward an already misunderstood issue: mental health. I’ll not go into that more here because, again, I’m trying not to give spoilers. Suffice it to say, I was disappointed. That being said, I’m pretty sure I’m in the minority in my negative viewpoints. Like Lavar Burton always said, “You don’t have to take my word for it!”. If you’ve read it, what did you think? If you’re looking for a good mystery, pick up And Then There Were None by Agatha Christie instead. Hi! Thanks for reminding me about this book! I actually also heard a lot of good things about it but forgot about it by now. I didn’t read the middle of your review because I was afraid there are spoilers there. Are there? Thanks for saying you didn’t like it. I’ll keep it in mind. Um..I would say “spoilers light”. Ha ha! Let me know what you think when/if you read it. Great review. I dislike books that are insensitive toward issues of mental health. I think I will give this one a pass. Thanks for the heads up!